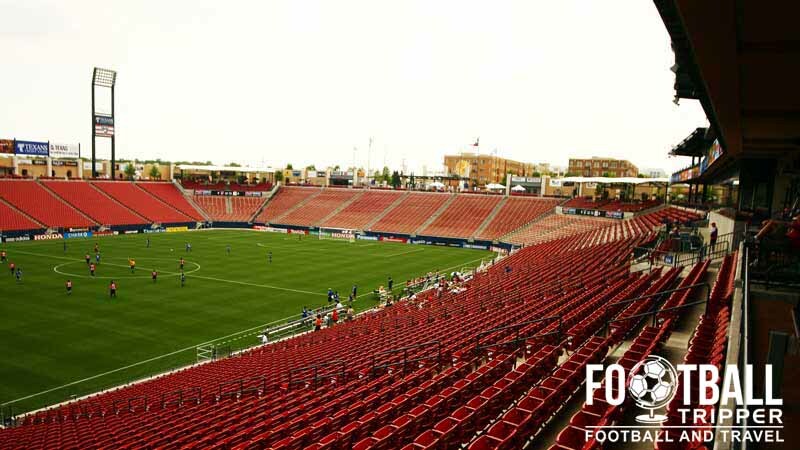 FC Dallas Stadium, known as Toyota Stadium after the name of the current sponsors and previously Pizza Hut Park, is a purpose built 20,500 capacity soccer stadium located in the city of Frisco in Texas. Not be confused with Toyota Park which is the home of Chicago Fire. The inaugural match at Toyota Stadium was held on the 6th August 2005 between FC Dallas and the New Jersey Metrostars who would later become known as the New York Red Bulls. Costing an estimated $80 million at the time, the stadium is a purpose-built soccer ground capable of seating 20,500 fans across a single-tier of seating. Consisting of a three sections of seats arranged in a U-Shape, the Northern End features a concert stage rather than a stand so that the venue can host mid-sized musical events as an additional source of income. Largely unheard off in European Soccer, having a stage behind one of the goal-ends is a common phenomenon in smaller American sports stadiums. Constructed within a wider sports complex which features over 17 soccer pitches including one known as Dr. Pink Field. Named after former Frisco Dr Erwin. 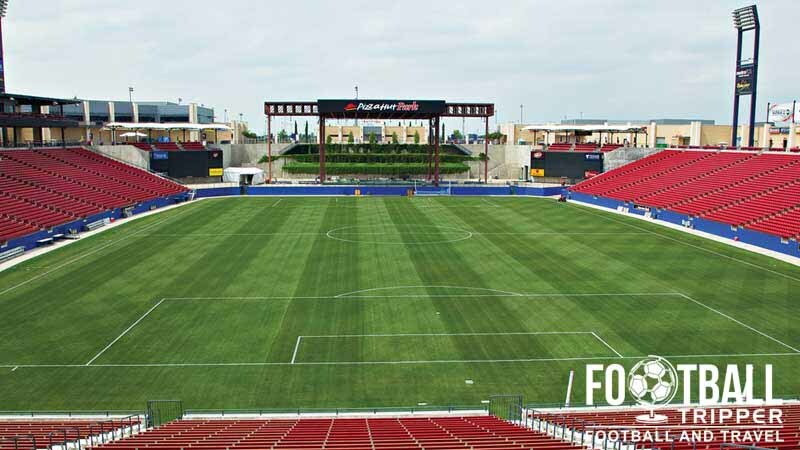 G Pink, the mix of artificial and natural playing surfaces allows teams at a variety of levels to play sports whether that’s College level or FC Dallas reserves. Upon opening the owners of the ground sold the naming rights to Pizza Hut, becoming the Pizza Hut Park (PHP). This lead to some fans informally dubbing FC Dallas’ stadium as both The Hut and The Oven in reference to the warm Summer climate of Texas. A year after the deal expired, FC Dallas announced a new sponsorship deal with Toyota on September 10th 2013 giving the ground its current name of Toyota Park. 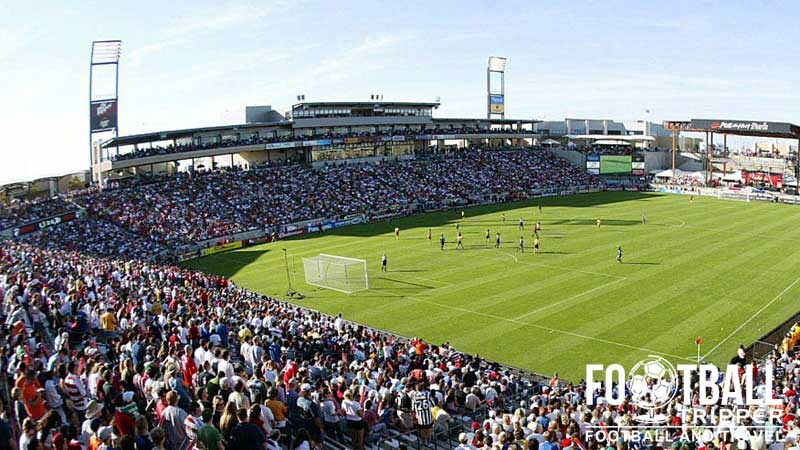 Ever since FC Dallas took on then European Champions Inter Milan on 5th August 2010 in front of a near sell out crowd of 21,193, similar size crowds at Toyota Park for MLS games have become increasingly common. The record attendance was recorded a year later when 22,565 fans saw LA Galaxy sneak a one nil win on 28th July 2012. Toyota Stadium is comprised of four stands: North, East, South and West. On the corner of Main street and Dallas Parkway there is the Londoner Pub which is a British themed sports bar, popular due to its proximity to the stadium. Slightly further away there is Main Event Entertainment which is also popular, with some fans opting to grab a beer at some of the bars within the nearby restaurants such as Manny’s Tex-Mex. There are over 82 concession stands throughout Toyota Stadium ensuring that fans don’t have to walk too far to get an injection of salt and sugar. The usual stadium fare is on offer including familiar classics such as hot dogs, hamburgers, popcorn and nachos. The home and away colours of FC Dallas are usually a good mix of red, white and blue. 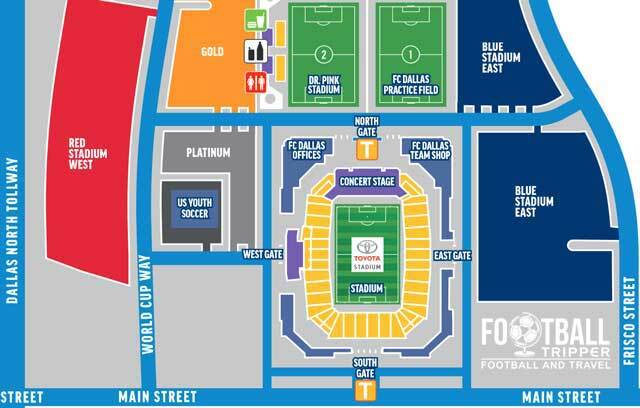 It doesn’t look like FC Dallas currently offer fans the chance to undertake a tour of Toyota Stadium. Needless to say if this changes we’ll be sure to update this section. Tickes to see FC Dallas play at Toyota Park during the 2015 season can either be purchased by visiting the official ticket page, and by selecting a match or by visiting the box-office in person in the lead up to the match. Please note that all ticket prices are listed for illustrative purposes and are subject to change. They also do not factor in booking fees and tax! 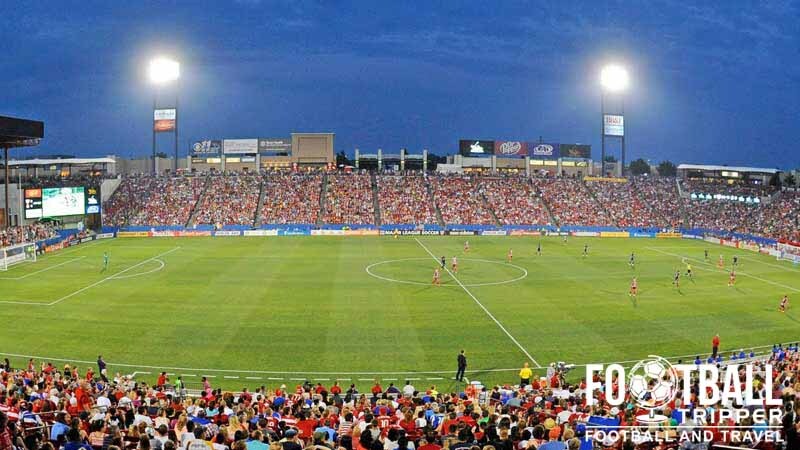 Toyota Stadium is embedded in the heart of a large multi-purpose sports, shopping and entertainment complex in Frisco, Texas, located at the intersection between Main Street and Dallas North Tollway. Toyota Stadium exterior as seen from on-site parking lot. Parking lots open for up to two and a half hours prior to kick-off and spaces are free for fans during FC Dallas Soccer matches. The caveat is however that other events on at the same time may charge, therefore you are encouraged to get to the stadium early to ensure you don’t have to pay for a space. FC Dallas Fans proudly displaying their colours. Tailgating is of course permitted providing you do so in a responsible manner. The closest hotel to Toyota Stadium is undoubtedly Comfort Suites Frisco which is located five minutes north-west of the stadium on Dallas Parkway. The other options are all back towards Downtown Dallas including Holiday Inn and a Hampton Inn & Suites.